Are you ready for the big pumpkin-flavored-palooza we call Thanksgiving? This is MaMa's favorite time of year for baking, because if you couldn't already tell, she loves pumpkin. Grandpa, Baby Brother and I couldn't get enough of these muffins. We think you'll like them too! 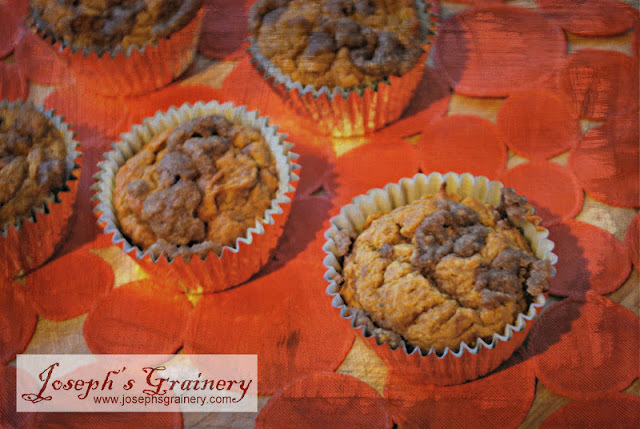 A scrumptious Fall breakfast treat. Line two muffin pans with 16-18 muffin liners. Mix the streusel ingredients together. Set aside. Mix the flour, baking powder, baking soda, cinnamon, ginger, and nutmeg in a bowl until combined. Set aside. In a smaller bowl, stir the butter, sugar, pumpkin, eggs, and vanilla together until combined. Fill the muffin liners 2/3rds the way up. Sprinkle each with 1 teaspoon of streusel. Bake for about 20 minutes or until a tooth pick comes out clean.